WELCOME TO LAKE NORMAN'S CULTURAL ARTS DESTINATION! Old Town Cornelius is home to a jam-packed lineup of exciting community festivals and events all year long. From Music Festivals and Art Crawls to Food Truck Rallies, Beer Festivals and Holiday Celebrations, there's always a reason to enjoy OTC. Mark your calendars, sign up for our newsletter, or check out all of the event details on our Facebook page so you can stay in-the-know about events and happenings! There's no better place to experience Old Town's unique culture than at the 2nd Friday Street Festival! 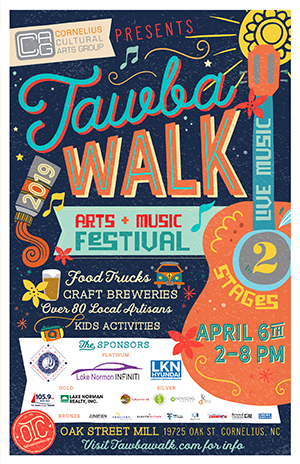 This monthly celebration of local art, music, food and drink has all the fixin's to make for an awesome Friday night here in Lake Norman's Cultural Arts Destination! 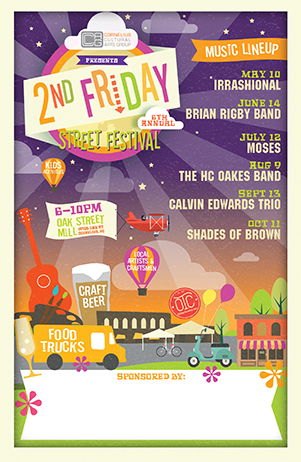 2nd Friday is held every second Friday of the month (May-Oct) from 6-10 pm at Oak St Mill and features a rotating lineup of food trucks & brews, artists & craftsmen, street performances, sip 'n shop specials, and a full concert from of the area's top bands! Get ready, Lake Norman! 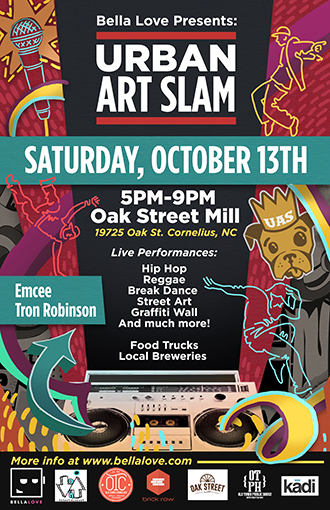 The Urban Art Slam is back and bringing an eclectic mix stunning visual and performing arts to the streets of Old Town! Join us on Sat, July 27 from 5-9 pm at Oak Street Mill for an electrifying evening of breakdance, hip hop, poetry, live artwork, graffiti and much more! Throw in the area's tastiest restaurants on 4-wheels, local craft breweries and vendors and you've got the perfect recipe for an unforgettable evening like you've never experienced before! Who's ready for a good 'ole fashion Food Fight?! Well... sort of... This annual throw-down of culinary creations has quickly become one of the area's most popular and well-attended food truck rallies. 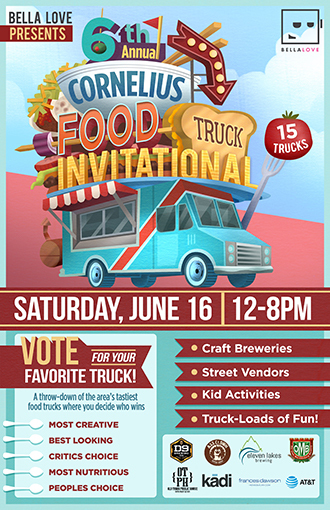 The Cornelius Food Truck Invitational features 15 of Charlotte's finest food trucks as they battle it out for YOUR vote in a variety of categories such as "Most Creative Menu", "Best Fried Food", "Most Nutritious", and the coveted "People's Choice" award! There's even a "Critic's Choice" round featuring a local "celebrity" guest panel of judges. Topped off with plenty of local craft brews, street vendors, and kids activities and this event is truly dining in style! Don't miss this year's edition on Saturday, Sept 7 from noon until 8:00 pm at Oak Street Mill. This annual tradition is putting OTC on the map... literally! Families can enjoy a fun-filled scavenger hunt through the street of Old Town, collecting stickers from participating businesses along with tricks, treats and maybe even some buried treasure. 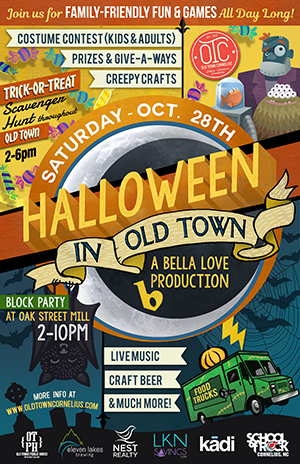 But the festivities don't stop there... Halloween in OTC features a Block Party Extravaganza at Oak Street Mill from 2-6 pm including a costume contest, games, creepy crafts, live entertainment, food trucks, craft breweries and much more! 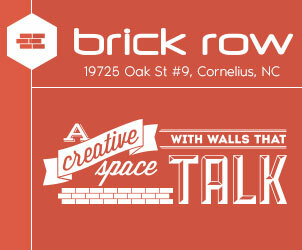 Introducing the debut of an exciting new event here in Old Town Cornelius! The Roots, Rhythm & Brews Festival will feature 25 of the area's tastiest breweries along with a jam-packed lineup of food trucks, live performances, artists, vendors and more! Through its performances and special guest speakers, the event will tell the story of Old Town's rich history and heritage with proceeds benefiting the Smithville Community Coalition. Ho Ho Ho! The holiday season wouldn't be the same without a community festival to bring all the Christmas cheer to the streets of Old Town! Live Christmas music, carols and choirs, holiday kids activities, and a visit from Santa himself are just the beginning of a festive afternoon in Lake Norman's Cultural Arts Destination. Our lineup of over 80 local artists & craftsmen will have everything you need to check off that shopping list, with one-of-a-kind gifts for all of your loved ones! 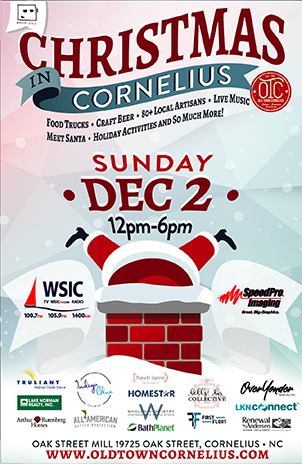 Of course, what goes better with an afternoon of shopping than hot cider, craft beer, food trucks and general holiday merriment!? Well then.. gather the whole crew, your furry friends too, and let's meet in Old Town for a holiday experience that's sure to get to get you fully in the Christmas spirit!